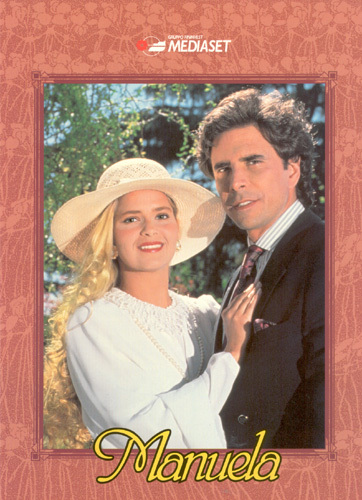 MANUELA is the first Italian made telenovela, co-produced by MEDIASET, CRUSTEL and DELATAVISION. The first episode was aired in Argentina on March 1993, while broadcasting in Italy, South America and U.S.A. Spanish channels began at the end of April 1993. Lead actors are GRECIA COLMENARES and JORGE MARTINEZ, both of whom are well known by telenovelas viewers all around the world. Locations of the interiors were shot at the CRUSTEL studios, in Buenos Aires, where HIGHLANDER 2 was also shot. MANUELA is an extremely high-budgeted production, with a very accurate screenplay, reviewed and post-produced by MEDIASET. The screenplay with its several coups de theatre and the different international locations where the story takes place contribute to highlight the differences between MANUELA and the other telenovelas. Los Angeles, Beverly Hills, Santa Monica and other places in California and Spain, together with Rome and Sestriere, in the Italian Alpes, are the locations that provide MANUELA with a distinct production advantage over the stereotypical Telenovela.